This group came from Lafayette to stay at the Pelican Landing camp and had an amazing day of fishing on day before yesterday. We ended up with 28 blackfin tuna and 8 red snapper. Give Angie a call to book your fishing trip 985-563-2531. The offshore rig fishing season has been awesome so far. These guys had two days of phenomenal fishing with us. We are located in Dulac, Louisiana and still have dates available for the federal red snapper season. Give Angie a call to get you trip of a lifetime on the books 985-563-2531. The crew from Coastal Corrosion Control enjoyed another two great days of fishing with us. They come to Dulac every summer to get in on some of the offshore rig fishing. We caught cobia, red snapper, mangrove snapper, blackfin tuna, and mahi mahi. The second boat caught bullreds, drum and speckled trout. We still have dates available for the federal red snapper season before it closes on July 14th. To book your fishing trip call Angie at 985-563-2531. We have been very busy this season and have not had a lot of time to be posting. On May 30th we had Multi-Chem out of Texas on the boat. They decided to get in on some of the offshore rig fishing action. We ended up with 8 blackfin tuna, 5 cobia, and 1 amberjack. We have availability for the federal red snapper season through July 14th. Give Angie a call if you would like to book an offshore rig fishing trip 985-563-2531. More photos from the rodeo. The company that I usually deal with for the Houma Oilman's Rodeo decided that they were not going to participate this year. So I teamed up with Topwater Charters for Friday and Saturday. Friday we caught speckled trout and bullreds. Saturday we caught speckled trout, redfish, and drum. We used live minnows, live shrimp and crabs for bait. We had a group in from Texas at the beginning of the week. We fished for bullreds, redfish, speckled trout and shrimp! We have some really GREAT customers and appreciate their loyalty!!! We had Mid South Extrusion on the boat the last few days. Yesterday we limited out on some nice sized speckled trout on live minnows. Today the speckled trout bite was fast and furious and we ended up with a bullred as lagnaippe before a squall chased us back to the dock. The speckled trout are biting and it is time to get your fishing trip on the books. We had Correct Solutions entertaining a group from Arkansas and north Louisiana today. The guys limited out with 20 redfish and 5 drum on shrimp under a popping cork. The fishing is heating up so give us a call to book your fishing trip 985-563-2531. I have been fishing with my wife a lot lately. She is an avid sportsman and loves fishing all species, especially speckled trout, redfish, bullreds, and catfish. These are pictures she took from some of our fishing trips. We recently took out a film crew from Meridian, Mississippi for a new TV show called 'The Road In Between'. The show is hosted by Tom Sikes and is filmed by the Tony Boutwell and Alan Burford from BrightFX. The show is about blending faith and culture in today's world. on the first day of filming, we shared how we blend faith and fishing. On the second day of filming we did a bullred fishing segment. Along for the trip was Mitch Mosley from Southern Chevrolet and Mike Giles who is an outdoor writer for the Meridian Star and Mississippi Sportsman. The fellowship, food, fishing and filming was great. The accompanying video was filmed by the BrightFX crew. They Rock!!! We have been fishing for speckled trout in Dulac. The bait of choice has been chartreuse split tail sparkle beetle double rigs. We took Fitzgerald Inspection out for cobia a few days ago. The bite was fast and furious and the guys had a blast! We used frozen sardines for bait. Give us a call to book your fishing trip 985-563-2531. We took a group from Richland, MS and Houston, TX redfishing the last two days. We used shrimp under a popping cork and caught our limits early. Thanks to Capt. Ross Eichorn for the additional boat! Friday we had a good day of trout fishing with the Excel Construction group from Baton Rouge. The weather was good and we were able to get out and catch some nice specks. The morning started out slow but the fishing got better as the day progressed. We used carolina rigs with live croakers and the action was great. By the end of the day we had a wheelbarrow full of nice speckled trout. To book your fishing trip call 985-563-2531. Thank you for the recommendation, we appreciate it! Fishing Flint Creek can be tough, but I have found that you need to fish out in the middle of the lake. Every morning the shiners come to the surface and the bass follow the bait. I suggest spinner baits or subsurface jerk baits. Good luck! Congratulations, that a nice buck. A comment titled: Dulac Sheephead, Trout & Redfish in response to a report titled: Perch? Catfish? Bass? Trout? Sheephead? Reds? The speckled trout fishing has been awesome. This is the episode of Louisiana Outdoor Adventures filmed aboard my boat. I own a charter fishing business that operates year round. I have been fishing the gulf coast since childhood. 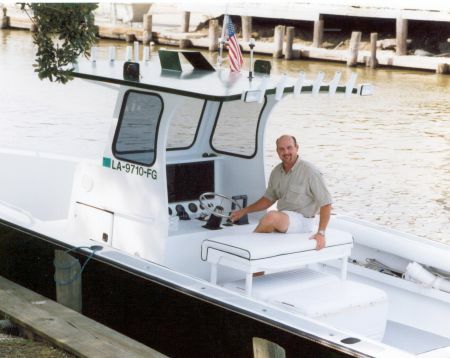 I worked as a charter captain for Sportsman's Paradise, Coco Marina, and Boudreaux's Marina before buying my own boat. I specialize in offshore, shoreline and marsh fishing trips. I am U.S. Coast Guard licensed and fully insured. I have a fishing camp available to accommodate your lodging needs. My web address is http://www.seacreaturecharters.com/ and I can be reached at 985-563-2531.